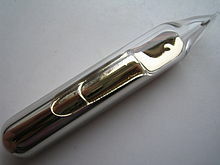 Caesium sī 1 ê hoà-ha̍k goân-sò͘. I ê goân-chú-hoan sī 55, hoà-ha̍k hû-hō sī Cs. ↑ Haynes, William M., pian. (2011). CRC Handbook of Chemistry and Physics (92nd pán.). Boca Raton, FL: CRC Press. p. 4.121. ISBN 1439855110. ↑ Dye, J. L. (1979). "Compounds of Alkali Metal Anions". Angewandte Chemie International Edition. 18 (8): 587–598. doi:10.1002/anie.197905871. ↑ "Magnetic susceptibility of the elements and inorganic compounds". Handbook of Chemistry and Physics (PDF) (87th pán.). CRC press. ISBN 0-8493-0487-3. 2010-09-26 khòaⁿ--ê. ↑ "NIST Radionuclide Half-Life Measurements". NIST. 2011-03-13 khòaⁿ--ê.
Chit ia̍h siāng bóe tī 2018-nî 6-goe̍h 10-ji̍t (Lé-pài), 03:40 ū pian-chi̍p--koè.